Of all the Hielo Continental Sur‘s 49 glaciers the park’s tourist star is Perito Moreno. 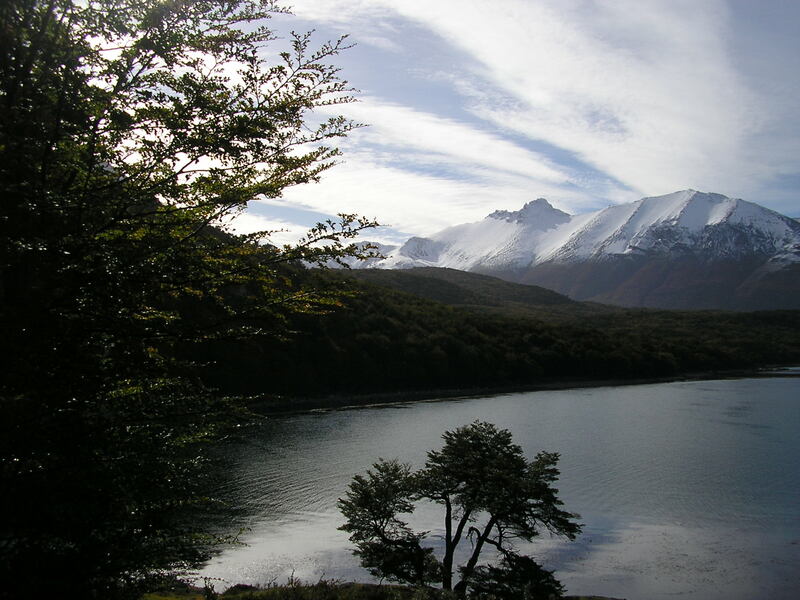 It’s located within Parque Nacional Los Glaciares established to preserve a vast region of Patagonia’s unique Austral Andes eco system. It’s accessible in the south from El Calefate – a town with all amenities on Lago Argentino – and in the north from El Chaltan – Argentina’s trekking center. Read why Perito Moreno is a Patrimony of Humanity…and why what you hear is startling. Only a few restaurants in Quito still serve cuy (roasted guinea pig) anymore, and it has become an exotic food. Although still common in remote village cuisines, even in urban Ecuador the sides would include potatoes, corn and grains in a variety of forms. Giant shrimp do not belong in the central Andes of Ecuador, but they do on the long Pacific coast. Modern transportation provides the means today to easily market foods within geographic regions. Quinoa, potatoes and corn are but three of a copious number of food stuffs indigenous to the Central Andes. Spanish conquest in the 16th century spread both these and many other agricultural products worldwide and introduced pigs and beef to South America. Today highways allow Ecuador’s Amazon River and Pacific Ocean fish and seafood to be served fresh in Quito at 9,000 feet elevation. In a recent trip to Quito I explored seven restaurants that firmly base their menus on traditional cuisine yet take a liberal hand their reinterpretation for the 21st century plate. Since the start of history gold has been connected to the divine and the boundaries of people, state and heaven have intertwined in myriad and mysterious patterns. In post conquest 16th century Quito (Ecuador), An A-list of priests, monks and nuns from four of the Church’s most influential religious orders provided the patronage for a celebrated era of artistic expression. Sumptuous interior decorations, intricate carvings and golden altars express prominent Moorish geometrical figures, Italian Renaissance style and European baroque architecture. In the 1970s UNESCO dubbed it “Quito Baroque” in their 1978 designation of Quito as a World Heritage Site. At least 4,000 varieties of potatoes grow in the Andean Highlands that encompass territory stretching from northern Argentina through Ecuador. An important food staple for all pre-Columbian Andean cultures, the Incas created chunu – dehydrated potatoes that could be stored for up to a decade. Our guide pulled the Land Rover off the road and stopped the engine. The lights were off; we were in total blackness and silence. I asked,“¿Cuál es el problema?” believing something must be wrong with the car. Opening the door, he replied, “No hay problema. 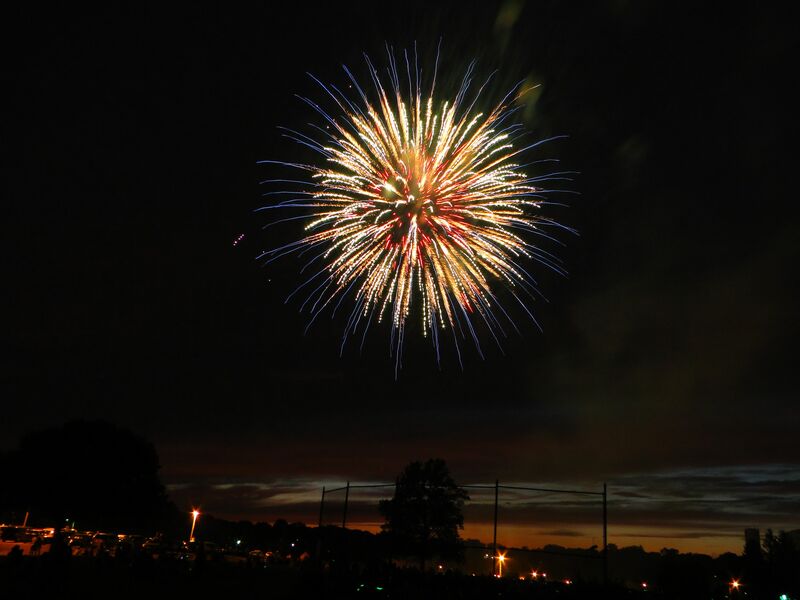 Las estrellas.” As eyes adjusted, the sky was ablaze with stars. The Milky Way was a sash of white gauze. The Southern Cross stood out clearly despite competition from a few million other constellations. Satellites passed overhead. Stars sparkled white, blue and red. The dome of the planet was a Christmas display. At 10,000 feet elevation in the middle of the Andes Mountains, there were no ambient lights to dim the awe we were experiencing. No wonder for thousands of years the indigenous peoples of the Andes have worshiped the land as a living force and looked upon the Pachamama – the Earth Mother – as their benevolent protector. The mountain environment provides for the people – pack animals, meat, cloth, water from the glaciers for drinking and irrigating the parched land. 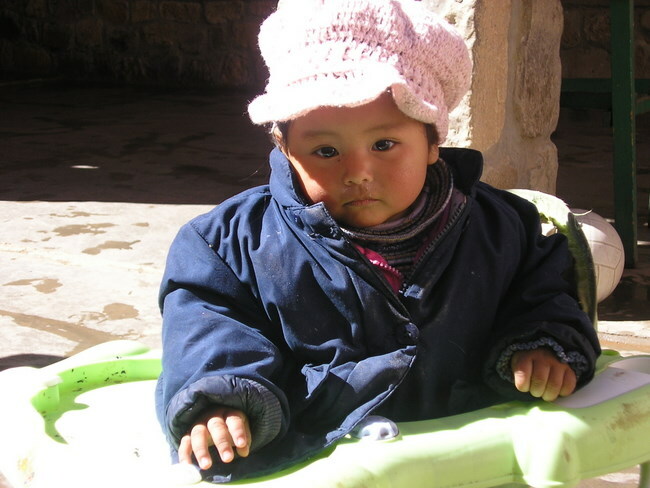 Despite Inca and Spanish conquest, both the indigenous cultures and the Pachamama remain. Jesuit missionaries were far too intelligent to attempt a wholesale, and fruitless, change of attitude. They could understand the correlation between Catholic beliefs in the Virgin Mary with that of the Pachamama and interwove their veneration. Roadside shrines can be seen today in the most remote mountain areas with statues to the Virgin Mary with traditional offerings to the Pachamama of food, jewelry, figurines, coca leaves and hundreds of burning candles. Argentina’s Andean Northwest is home to cultures that have called it home for 9,000 years. Irrigation canals constructed 3,000 years ago still water fields. 3,500 year old villages are alive with people in traditional clothing except it’s not a fashion statement. Hornos, outdoor clay ovens, are the center of the kitchen; adobe houses are constructed as a community effort without power tools. 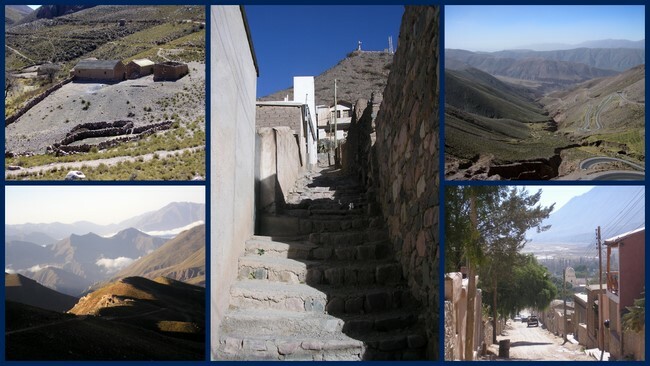 The ancient village of Tilcara, 1,100 miles northwest of Buenos Aires, is an excellent base to explore the UNESCO World Heritage Site of the Quebrada de Humahuaca. The mountain enclave of Iruya is reached only after a surreal six hour journey. At 13,000 feet, the Salinas Grande Salt Flats seem like a different planet, and not too far north, near the Bolivian border, the legendary Ruta 40 begins its 5,000 mile journey to Tierra del Fuego. Brown is the color of Tilcara, but don’t let that deter you from staying. Its brown adobe buildings, tan stone streets and dusty countryside provide a beige backdrop for the stunning multi-colored reds, greens and pinks of the surrounding mountains. 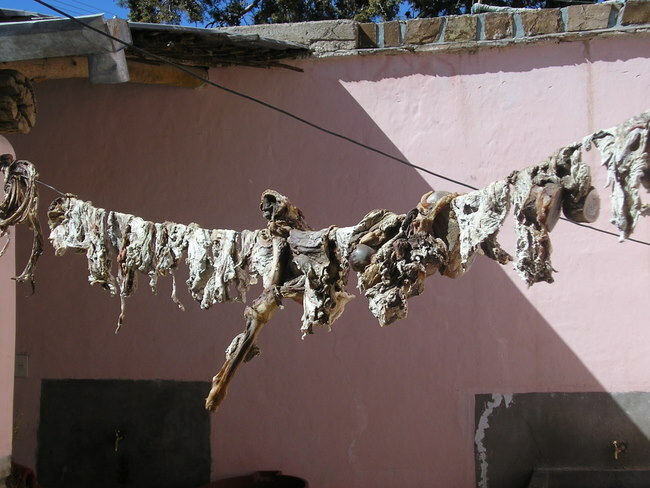 The brown of Tilcara is also a foil for the bright colors of indigenous handicrafts – multi colored garments made from soft alpaca and llama wool along with many forms of pottery based on ancient designs. 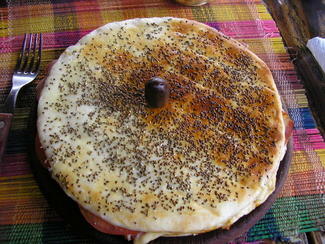 The senses are entertained by the aromas from food stalls selling humitas – a creamy corn and cheese mixture wrapped in corn husks – empanadas – an Andalucian savory pastry first made by the Moors of North Africa – fresh grilled tortillas and the incomparable Andean goat’s milk cheese Queso de Cabra. To explore the rugged countryside of the Quebrada requires a four-wheel drive vehicle. Many of the roads are unpaved, twisty and narrow. The journey to Iruya explored a surreal mountain landscape – barren and rocky, nearly unpopulated, at elevations exceeding 9,000 feet – punctuated by tiny villages and steep valleys shrouded in clouds. In Uquia’s 17th century Iglesia de San Francisco de Paula is a priceless collection of the Angeles Arcabuceros(Angels with Guns). 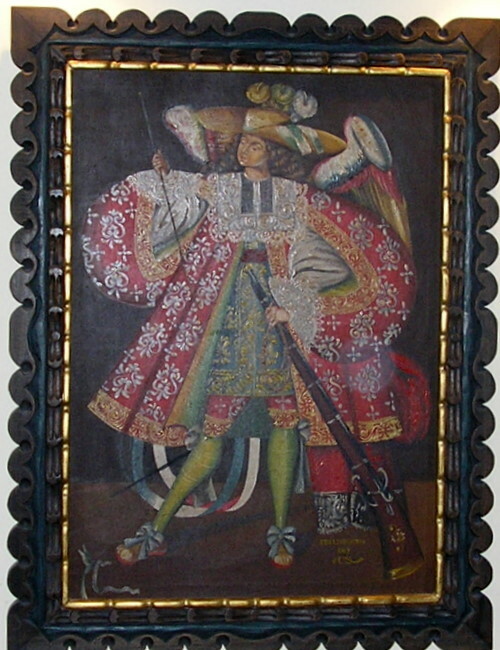 The paintings depict winged angels fully dressed as conquistadors bearing guns and swords – not too subtle Spanish Colonial propaganda. Several miles further I spied a road side shrine to folk hero Gauchito Gill. Throughout Argentina, shines to this 19th century gaucho Robin Hood are visible on rural road sides identifiably draped with red banners. He is especially revered in the north where he led a peasant rebellion against landowners, was captured and executed. Numerous miracles have been attributed to Gauchito Gil, and he has a large cult-like following. 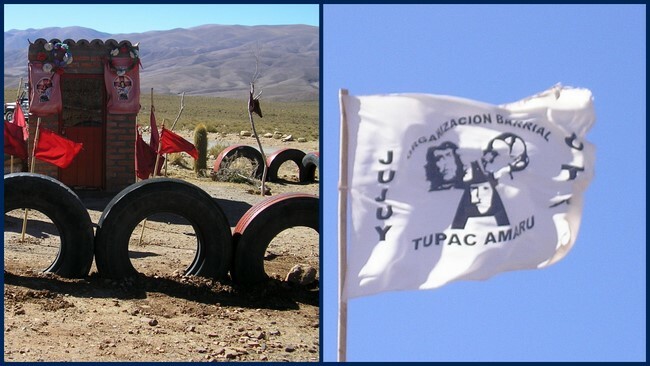 Red banners and depictions of Gil’s heroism are frequently superimposed on the cross and may be flanked by the unlikely triumvirate of Evita Peron, Che Guevara and the last ruling Inca, Tupac Amaru. Our guide had prepared a picnic lunch. Before eating he poured a portion of our drinking water onto the soil. It was the offering to the Pachamama. This was not a gesture to fascinate tourists – this was for real. 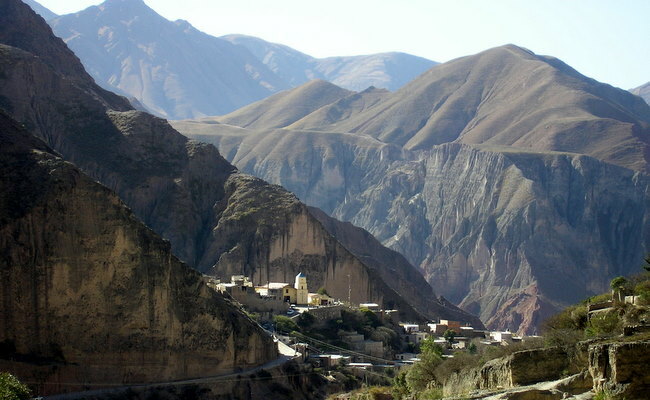 Iruya, with a population of 4,300 at an altitude of 9,120 feet is perched on the mountainside high above the Rio Iruya. Its white buildings, dominated by its much photographed Igelsia de Nuestra Senora del Rosario y San Roque, gleam in the sun as they rise in a jumble up the green-brown hills. Many of its streets are literally stone staircases and negotiating this labyrinth can be bewildering at first when the street dead ends at the door of a house. 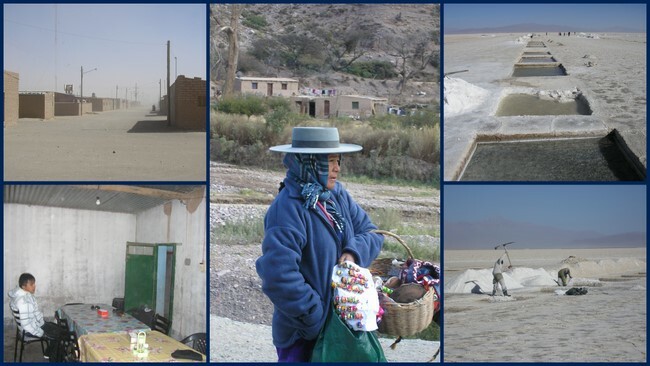 The following day our excursion to the Salinas Grande Salt Flats traversed numerous switchbacks as we climbed through the spectacle of the Cuesta de Lipan offering panoramas of snow covered peaks and barren steppe. A road side marker indicated the highest point for this route, 13,344 feet. As we descended, the gleaming salt flats came into view. Amid the treeless, brown countryside of the altiplano, the vast Salinas Grande Salt Flats reflected the sun like an immense solar collector. These are among the world’s largest and highest naturally renewing salt flats in existence covering an area of 3,200 square miles. Salt extraction has gone on for decades using unchanged hand methods. Walking on the flats is nothing less than other-worldly. In the thin winter air at 12,000 feet the strong wind was biting yet the experience exhilarating. Sunglasses are necessary – the glare off the salt is blinding without them. The flats resemble cracked concrete except there’s a crunch under your feet. Comunidad Aborigen Tres Pozas is eight miles west of the flats, and the only human settlement for many miles in any direction. It’s the home for most of the workers and consists of a few dozen simple adobe buildings as brown as the surrounding desert. The winter winds were creating a sand storm. Sand whipped by high winds can find its way through closed car windows and doors lodging everywhere inside your clothing, your mouth, nose and ears. The café, Comedor Las Guapas Salineras, is not an establishment any guide book would recommend for dining, but I’d highly recommend if you want to actualize that overused phrase “an authentic experience.” The education is startling and humbling. For an absurdly small price, coupled with genuine kindness and effort, you dine on simple food in conditions few of us would ever accept. 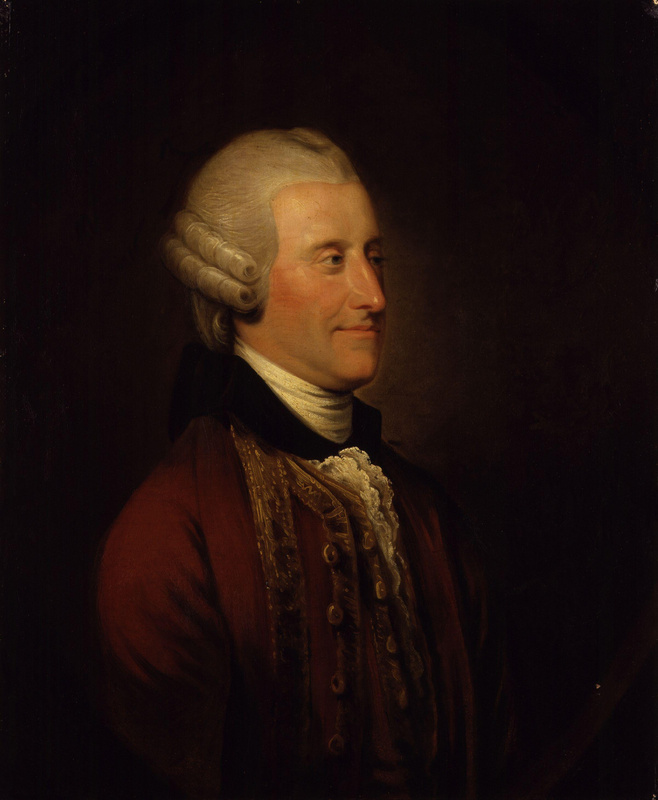 If John Montagu, 4th Earl of Sandwich, had been an Argentine he would have enjoyed slices of ham tucked between bread, not beef. The pig had been domesticated since 4900 BCE. The Romans had hams since at least 400 BCE. Backpacking in England (1971 ACE) every British pub had ham and cheese sandwich – two paper-thin ham slices, one of cheese on white bread (no butter… well sometimes, rarely mustard…) I’d say it’s a good bet Montagu had ham tucked into that first sandwich. 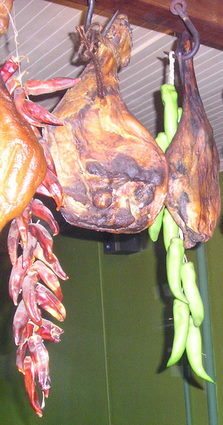 Iberian hams were already famous when the Romans arrived on the peninsula. Wild pigs lived an idyllic life roaming free in the woods eating a natural diet of acorns, herbs, roots and legumes. Cured, air-dried and aged using centuries old methods, the paper-thin reddish slice’s intense flavors are released slowly as your mouth moistens the ham. This is not Oscar Mayer lunch meat, and I’m going to assume the Spanish slapped some Jamon Iberico between pan eons ago. 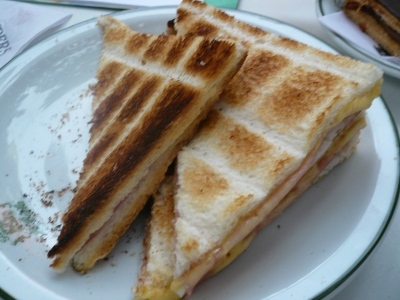 In Argentina the vast array of ham and cheese sandwiches seem odd only to tourists. 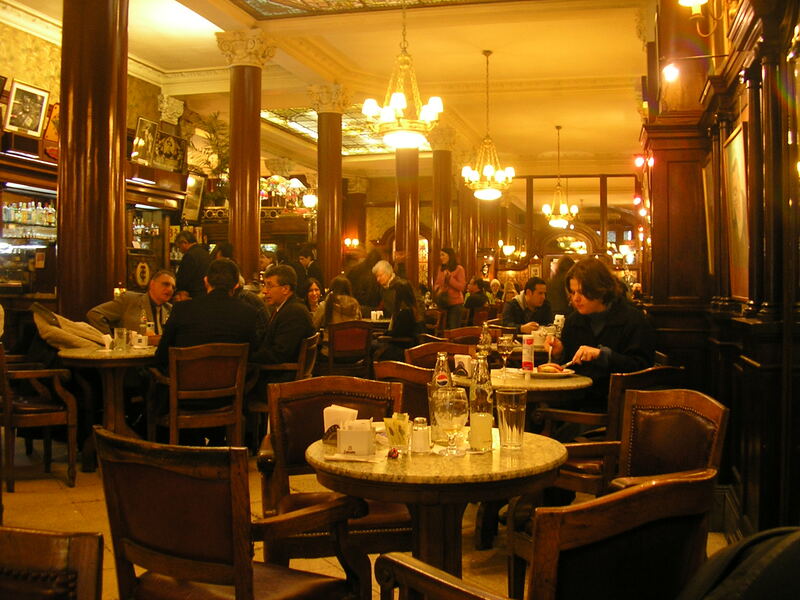 In their local areas, these café standards reflect a cultural fusion that is the hallmark of the national cuisine. Spanish (Andalucía and Basque), French, Italian, and English hams all took their place in new Argentine settlements. Along with these cuisines’ love of cheeses and breads, the recipe for a ubiquitous national dish arose – tostado de jamon y queso. Yet as in any fusion, not all jamon y queso look-alike: grilled open-faced with blue cheese sauce, or with hard-boiled egg and anchovies, as a pizza topping, or a delectable gourmet creation on homemade bread are a few variations I’ve munched. 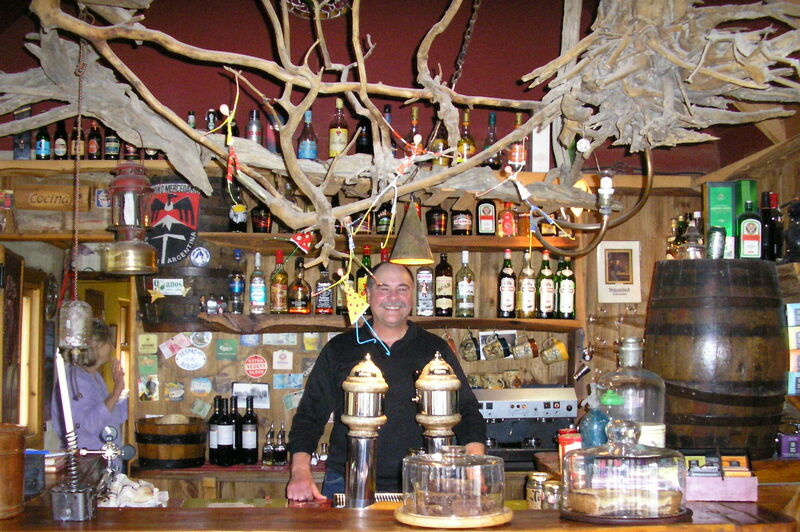 At Butch Cassidy and the Sundance Kid’s favorite haunt in northeast Patagonia, the Café Hotel Touring Club, (Fontana 240, Trelew) they’ve been serving the granddaddy of all since the 1890’s: tostado de jamon y queso – toasted, buttered, thin sliced bread with a couple of slices of ham and cheese. It’s not quite an American grilled ham and cheese but more than just cold ingredients on dry toast. A tostado de jamon y queso is best if the buttered sandwich is grilled on a ridged pan, to create grill marks, while gently pressing. The cheese should be wilting, not melting and the ham warm. It is simplicity itself and only as delicious as the quality of the ingredients. 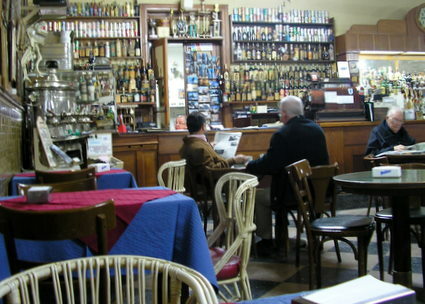 The Touring Club could use a better ham, but relaxing in its faded early 1900’s interior with a cold cerveca, or café, and a tostado, you know why Butch and the Kid felt safe here. 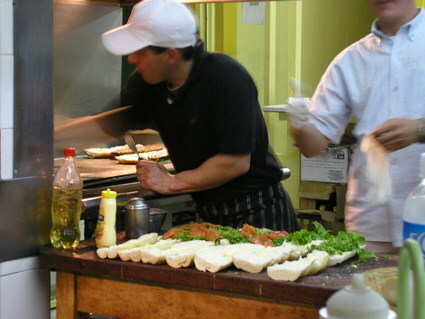 The oddest variations were on a pizza and the varieties served on Argentina’s long distance, inter-city busses. The central Andean city of Mendoza may be world-famous for its wine, but to Argentines, the city’s culinary fame is its thick, southern Italian style pizzas. Capri (Ave. San Lorenzo y San Juan) is a Mendoza institution that I was told I had to try. I did, twice, but I must admit I was not impressed with their “special” pizza – a thick layer of mozzarella cheese was covered by slices of boiled ham with sweet marinated red peppers and olives. I’m not quite sure what that has to do with southern Italy, especially since it lacked seasoning of any kind. But lots of Mendozans were ordering. Argentina’s private, long distance, inter-city busses are spacious, comfortable, modern, inexpensive and efficient. Meals appropriate to the time of day are always included in the fare. Whereas the quality of the buses is high, the food looks like its been catered by a convenience store. The entrée at dinner might be some sort of chicken or pasta, at lunchtime it’s frequently variations on ham and cheese. 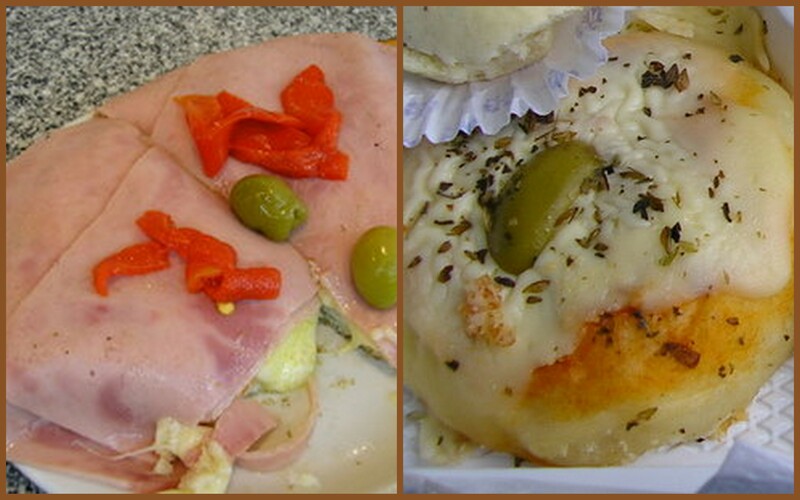 Besides a cold jamon y queso on buttered white bread, appetizers and extras at any meal may include: a semi-sweet “cake roll” with ham, a packaged square of a sweet shortbread with ham and cheese and/or a warm bun with ham topped by melted mozzarella, an olive and oregano. Modern life is replacing the jamon in sandwiches with unremarkable boiled commercial ham that lacks the rich flavor of a good baked, smoked or cured ham. 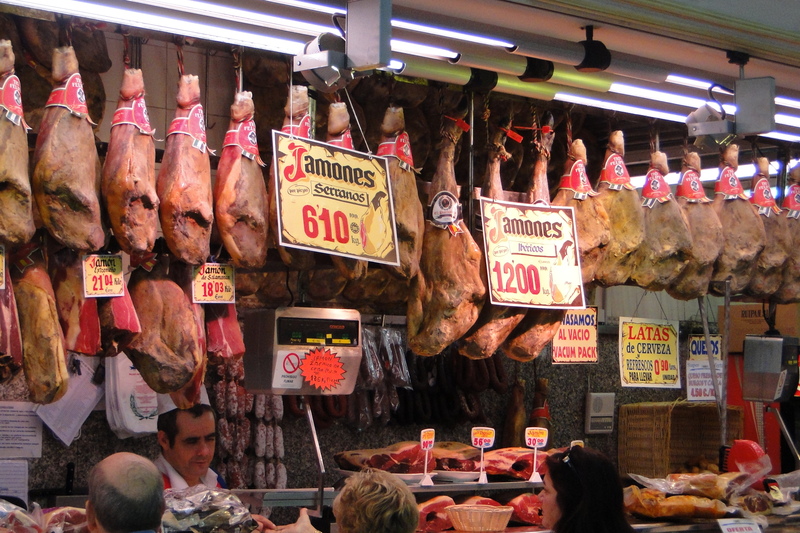 But a variety of local smoked hams are available from any market in the country. Argentina’s Spanish-style cured hams, the best being the jamones serranos from the Sierras de Córdoba in central Argentina, are not used in sandwiches but rather served thinly sliced accompanied by an assortment of sausages, salami, cheeses and breads. Likewise, processed cheese has invaded the nation, but regional cheeses are abundant. 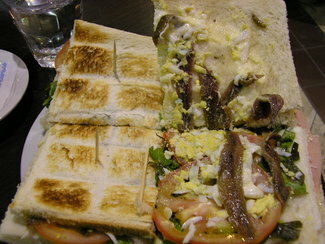 For sandwiches, Argentine’s prefer mild cow’s milk varieties such as Patagonia’s Queso Chubut. When quality ingredients are utilized, this lowly sandwich reaches for the culinary stars.